Movies At Dog Farm : Barking At The Vacuum Cleaner - Bates Motel, Hemlock Grove, The LAMB, And More . . .
Barking At The Vacuum Cleaner - Bates Motel, Hemlock Grove, The LAMB, And More . . .
We'll leave the light on . . . 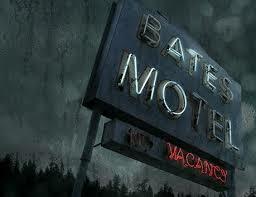 I loved Bates Motel, and I'm already eagerly anticipating Season 2. Season 1 was a little bit of a train wreck, but it was an entertaining train wreck. The soapy narrative twists kept me anxious each week for the next episode. I think it's great that Vera Farmiga as Norma Bates isn't afraid to "go large" with her characterization. Did Norman kill Miss Watson? I think not, but we'll find out when Season 2 hits in 2014. On the other hand, I was surprised by how underwhelmed I was by the Eli Roth produced Netflix series Hemlock Grove. Full disclosure: I've only watched the first episode, and I'm just not real tore up about watching the second one. Shelley the mute deformed giant is the only character introduced that piqued my interest at all. Am I missing out? Was I too inpatient for greatness to reveal itself? Maybe Roth will redeem himself with his producing/writing/acting efforts in the newly released Aftershock (2013). I'm also looking forward to The Green Inferno (2013), his forthcoming directorial effort born of his love for Mondo movies. I'm pleased to announce that Movies At Dog Farm is now officially LAMB #1565 in The Large Association Of Movie Blogs (The LAMB). Thanks for having me, folks! I've gotten two new books, and I have a third on the way. I've only gotten about a hundred pages into Reel Terror by David Konow, and so far, so good. So many authors have tackled the Universal horror classics, EC Comics, Psycho, and other horror movie signposts that it's difficult to dig up fresh material. Konow frequently makes use of quotes from pertinent individuals to illustrate his points, and it's always a hoot reading Christopher Lee explain once more why Hammer's Dracula ceased to speak in the latter movies. Book number two is Horror! 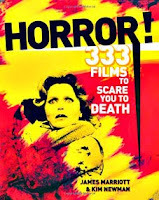 333 Films To Scare You To Death by James Marriott and Kim Newman. Newman frequently appears as a "talking head" in my beloved horror movie documentaries. I read Newman's Nightmare Movies last year, so I decided to give this one a shot, too. I've yet to crack this one, so I'll have to get back to you . . .
Book number three, as yet undelivered, is 101 Horror Movies You Must See Before You Die by Steven Jay Schneider. Finally, Don Coscarelli's John Dies At The End (2012) is currently available on Netflix streaming. Watch it now if you haven't already. Watch it again if you have. Highly recommended. I haven't tried to watch Hemlock Grove, and I'm not really too interested (though I like Eli Roth), but I would like to see John Dies At the End. Thanks for visiting the Dog Farm, Doug. I took a look at your blog, as well. The Sky Has Fallen has been added to Other Dogs Barking (Blogs) in the sidebar. John Dies At The End is a blast, btw. It's currently available on Netflix streaming if you haven't caught it yet. Whats the good word Brandon? 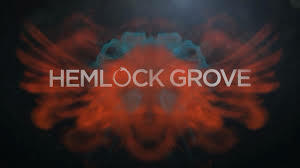 The misses has been watching a bit of that Hemlock Grove but I have yet to check out more than a few bits and pieces. First time visitor, I saw that you had recently joined The Lamb and I wanted to stop by and say hi and welcome aboard. When you get a chance swing by our humble film blog and say hello. Thanks for the welcome 3 Guys 1 Movie! Which guy am I addressing? I've checked out your blog, as well, and I've added it to Other Dogs Barking (Blogs). Thanks again for visiting.